Would you like to organize a draw on your Facebook Page between all users who comment on or ‘like’ a number of your posts? The Facebook Giveaway app enables you to select a number of posts published on your Facebook page and then carry out a draw between all the users who have interacted with these selected posts. See here some practical examples. Below we explain how you can add various posts from your Facebook page to the same draw. The posts must be imported at the same time, therefore, the process of importing the posts must be done when the participation period in all the posts has finished. Any post published on a single Facebook Page can be selected, regardless of when it was published. A maximum of 10 posts can be included in the same sweepstakes. Duplication control: although a user comments on, or likes, various posts he or she will only be entered into the sweepstakes once. Note: The opportunity to include various posts in a single sweepstakes is available free of charge for accounts with a monthly subscription. If you do not have a subscription, the system will allow you to purchase a Basic subscription ($29) which will allow you to include various posts in the same sweepstakes. 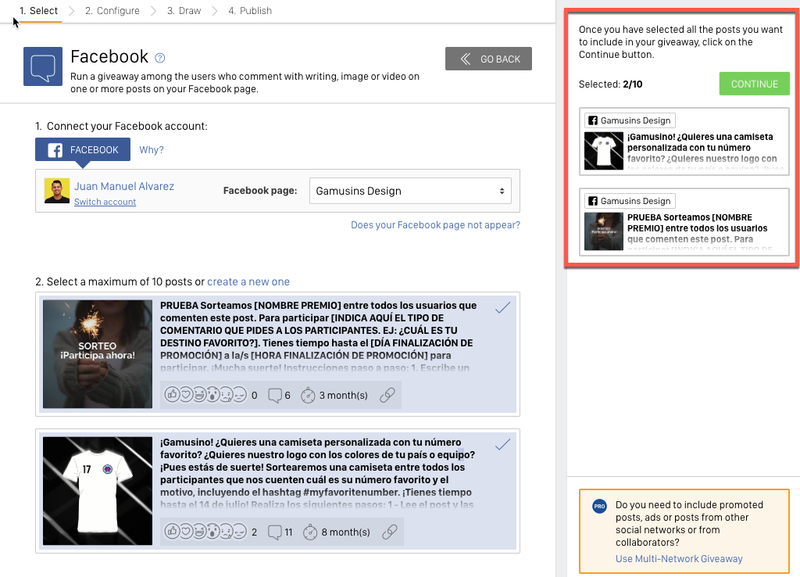 How can you use several Facebook posts in a single sweepstakes? In order to use several posts in the same draw, you must wait until the participation time has ended. It is for this reason that you must import all the posts at the same time. It is not possible to add a post to a draw once it has been imported into the platform. If you want to know how to import a Facebook post, we recommend that you follow the steps in the "Tutorial: How to carry out a draw from a Facebook publication". 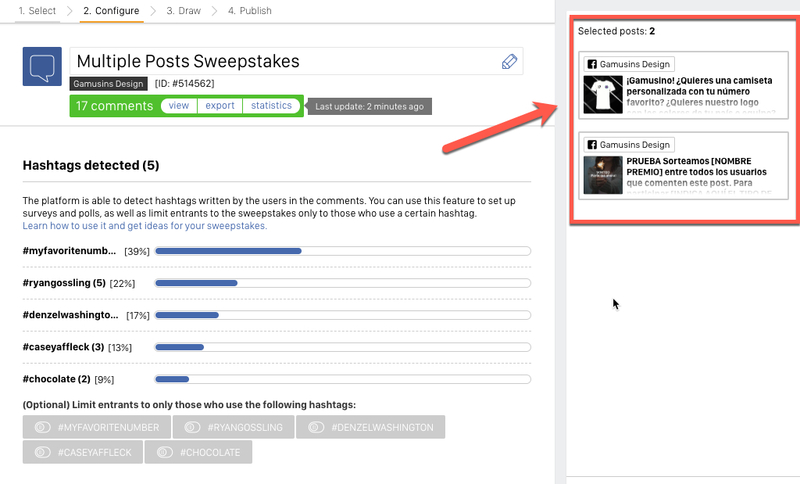 From the Sweepstakes Settings Page the system will inform you how to select other posts from your Page from which you would like to gather likes or comments. The process of accumulating various posts will be different depending on whether your account is an active subscription. Do you want users to comment on a minimum number of posts to enter the draw? 3. Once you have paid, the subscription will be activated automatically so you can return to the sweepstakes management page and add whichever posts you need following the steps indicated above. Tip: Did you know that the Basic subscription will enable you to carry out unlimited sweepstakes? Also included are all the apps available for the Basic version, such as: photo and text contests, sweepstakes with registration and coupon distribution. Here we explain everything that’s included in the Basic subscription to help you get the most out of it. 1. Carry out reminders for a single sweepstakes. If you have published on your Facebook Page a sweepstakes that is going to last for several days, a good practice to encourage and engage your fans is to publish various posts over the course of the week, reminding users to take part. In this way you can reach new users, since the more posts you make, the further they will reach. 2. Launch a different question every day for a week and carry out a sweepstakes among all of them. Facebook sweepstakes are an excellent way of improving interactions in your Facebook Page, and if you also present the sweepstakes as a challenge or game, users will be more prepared to take part, thus increasing levels of participation. If you also organize regular sweepstakes for your followers on your Page, you will keep your users engaged and looking forward to the next sweepstakes. Sweepstakes with fun and entertaining dynamics are very successful among communities of followers of a brand. Therefore, you can organize a week-long campaign in which users must answer the question of the day, or you can challenge your fans with a new riddle or puzzle each day. Upon finalizing the campaign you can carry out a sweepstakes among all those who participated during the course of the week. 3. Have you published a post and now wish to promote it but Facebook but won’t let you? You’ve posted the announcement of your sweepstakes to your Page and after a few days you decide to promote it with publicity to reach more users. However, the creative content accompanying the post does not meet Facebook’s requirements for promoting a post and therefore your ad is not approved. What can you do? Don’t worry because you have a solution: publish a new post with creative content that meets Facebook’s specifications. In this way you will have two posts announcing the sweepstakes, but once the participation period is over you will be able to include participants who responded to either of the posts.